Last week (6-8-13) the first emergence of the adult red-headed flea beetle (Systena frontalis) was observed in a Cumberland County nursery. This insect has been a major pest at numerous NJ nurseries during the past several years. Primarily a concern with container crops in nurseries, it has an extensive host range. 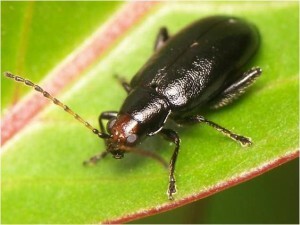 The foliage damage to plants from this 0.2-0.25 inch adult beetle can become extreme. Commonly observed nursery hosts of the adult flea beetle include Ithea, Salvia, Buddleia, Veronica, Coreopsis, Weigela, Hydrangea, & Rudbeckia to name only a few. This flea beetle species typically has a prominent reddish head with the thorax & abdomen being a distinctive shiny black. 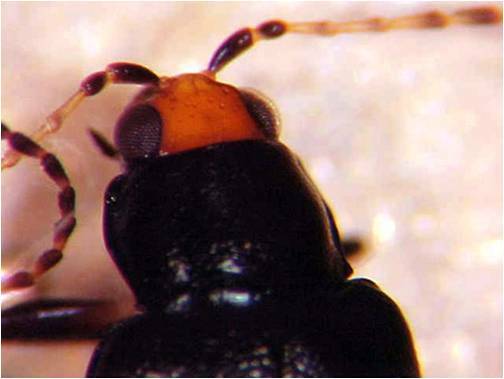 The enlarged femur at the hind legs enables the flea beetle to rapidly “hop” when disturbed. In New Jersey there are usually 3 generations during the season and therefore feeding damage can occur from mid-June through much of September. Overwintering in the egg stage, grubs hatch during the 2nd half of May. First generation adult emergence occurs about a month later (550-750 GDD) with the additional 2 generations producing the potential continued feeding damage that can span several months. 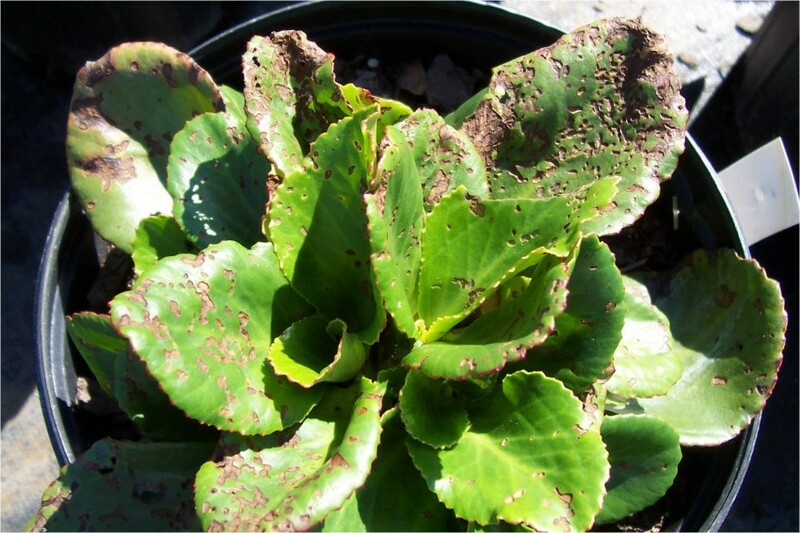 Adult red-headed flea beetle feeding symptoms can be variable depending on crop leaf types. Feeding on thinner leaves tend to produce skeletonized symptoms or may even result in a shredded appearance. With thick, fleshy leaf types (e.g., Sedum), the feeding symptoms can mimic the light colored linear patterns seen from leaf miners. Although possible, it is unlikely that adult red-headed flea beetles are emerging from container media. The source of infestations into nurseries is usually from adjacent fields that contain plants this insect also feeds upon. Apparently corn & soybean crops are potential hosts as well as potatoes, cranberries & blueberries. Additionally, this beetle will feed on many field weeds such as smartweed, jewelweed, & Joe-Pye weed. 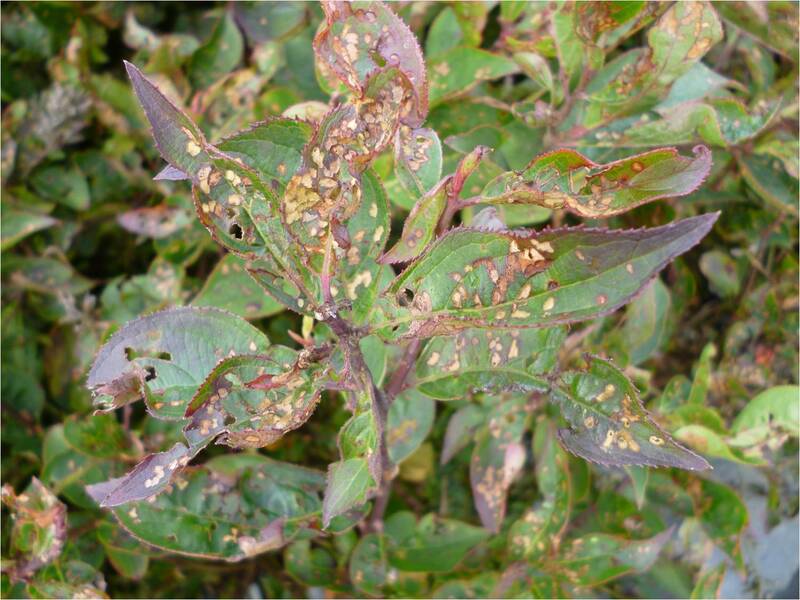 Although chemical controls against the feeding adult can be effective, nurserymen attempting to protect crops often require repeat treatment applications. The use of neonicotinoids such as imidacloprid (Marathon) & dinotefuron (Safari) can provide residual preventative controls, but experience has shown it may also be necessary to apply knockdown rescue treatments such as pyrethroids (i.e., cyfluthrin (Decathlon) & lambda-cyhalothrin (Scimitar)) or cararyl (Sevin). 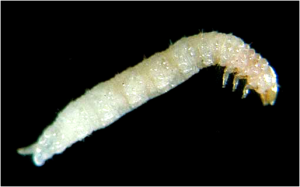 Some immature larvae may be found in the container media feeding on roots, but typically cause insignificant damage. Controls targeting adults are most effective.